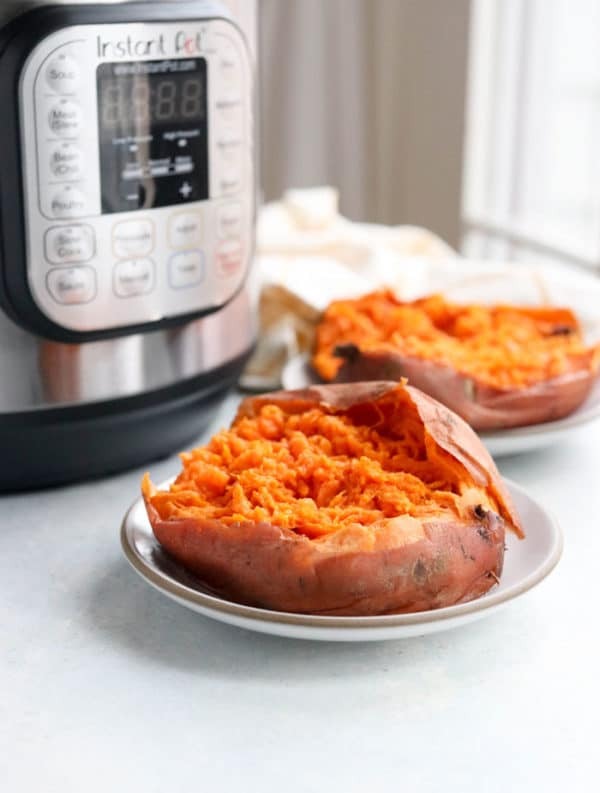 If you love hands-off cooking, you’ll love these Instant Pot Sweet Potatoes. I love how they get perfectly tender, without turning on your oven or heating up your kitchen! Why cook food in a pressure cooker? There are several reasons to cook food in a pressure cooker, rather than using the stove or oven. The first being that it makes the process totally hands-off. Just add the sweet potatoes (and water to the bottom of the pot), seal the lid, press a button, and walk away until they’re done. There’s no risk of the potatoes burning like they might in the oven. Pressure cooking has also been shown to preserve more nutrition in food when compared to other methods of cooking. (source) This is possibly due to the fact that the pressure cooker cooks foods at a lower temperature than most other cooking methods (usually at or below 250ºF), while also being faster in many cases. 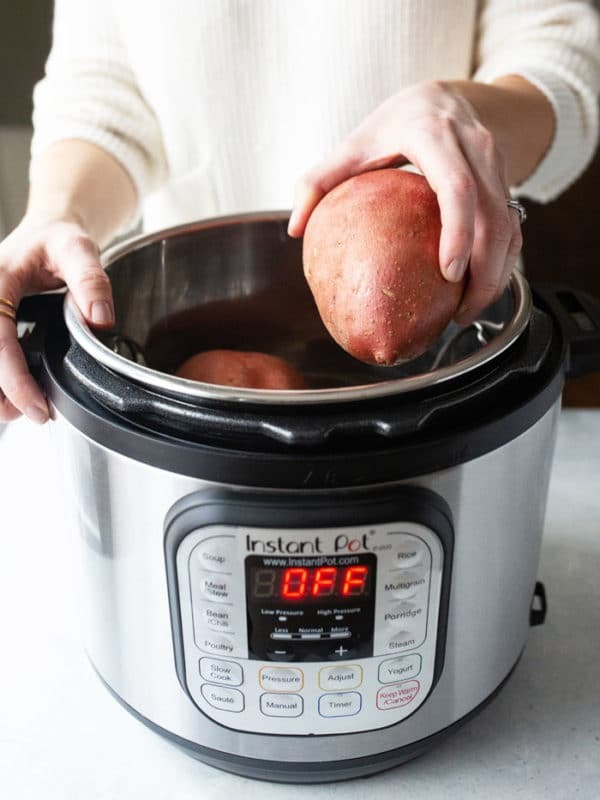 Looking at the general Instant Pot time charts online, I found the proper times for cooking whole sweet potatoes to be a bit vague. A “small” or “medium” potato isn’t super-descriptive as far as weight goes, so I took to my kitchen to experiment with my Instant Pot, kitchen scale, and several sizes of potatoes. All of these timings above are using the manual high pressure setting, and allow for 10 minutes of natural pressure release before opening the lid. So, be sure to add about 8 minutes for the pot to pressurize, and 10 minutes for the pot to de-pressurize to your overall expected time. This means a small sweet potato will take 38 minutes total, from start to finish. Again, the timings above are very general, so your potatoes might need another minute or two if you open the lid and find they are still a bit firm in the center. If you prefer to have an exact timing formula, I’ve found that you can multiply the weight of the potato (in ounces) by 2.5 minutes to get a more exact time. For example, an 9 ounce potato x 2.5 minutes = 22.5 minutes of cook time at high pressure. (Plus the 10 minute natural release later.) And a 16 ounce potato x 2.5 minutes = 40 minutes of cook time at high pressure. Note: If you’re cooking multiple sweet potatoes that vary in size, always go by the cooking time for the largest potato to ensure they are fully cooked. (It’s not a big deal if you over-cook the smaller potatoes.) If the potatoes are drastically different, you can cut the extra-large potatoes in half to shorten their cooking time. The cubed sweet potatoes can be easily mashed for Mashed Sweet Potatoes, added to my Sweet Potato & Quinoa Mason Jar Salads, or can be saved and used later in a Sweet Potato Smoothie. If you’re wondering what to serve your sweet potatoes with, I thought I’d share some of my favorite pairings. For food combining purposes, I like to serve baked sweet potatoes with a vegan salad or soup for a filling, yet easy-to-digest meal. 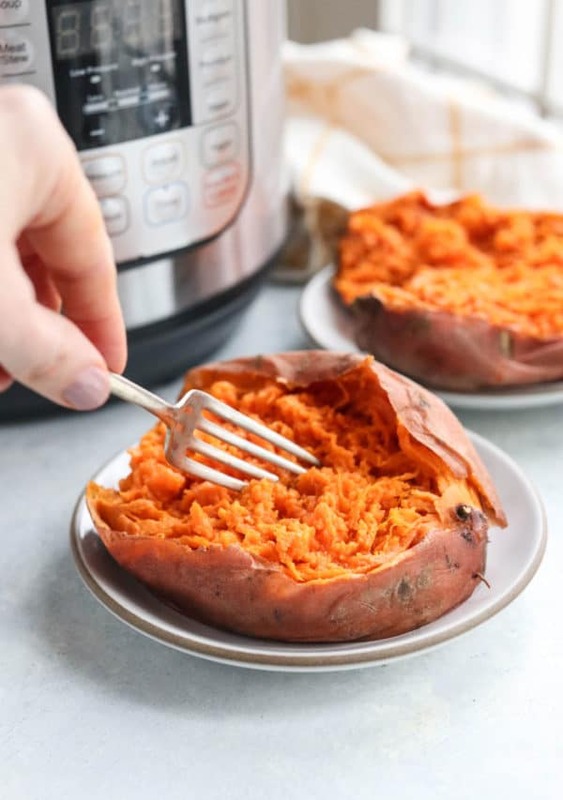 However you serve these Instant Pot Sweet Potatoes, I hope you’ll love them! If you have leftover sweet potato, keep in mind that they freeze well, too. You can save the frozen sweet potato to add to smoothies or curry sauces in the future. 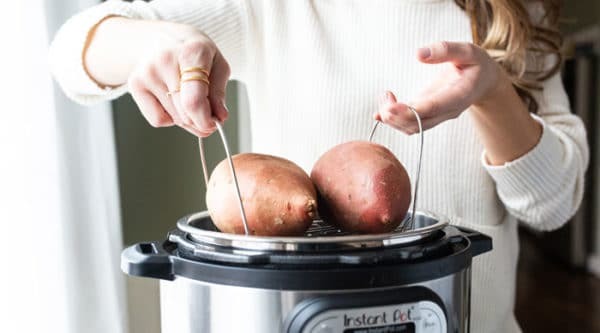 Fill your Instant Pot with 1 cup of water and place the trivet that comes with your machine on the bottom, to keep the sweet potatoes above the water. When the floating valve in the lid drops, it's safe to remove the lid. Use oven mitts to remove the hot sweet potatoes from the pot. You can let them rest until cool enough to handle, or slice them in half immediately and serve piping hot. Leftover cooked sweet potatoes can be stored in an airtight container in the fridge for up to 5 days, or frozen for up to 3 months for future use. If you know the exact weight of your sweet potatoes, you can use that to calculate the proper cook time. Multiply the weight of your potato (in ounces) by 2.5 to get the minutes you'll need to cook at high pressure. For example, an 8 ounce potato x 2.5 = 19.2 minutes. I round up to 20 minutes, since the Instant Pot only cooks in whole numbers. Always allow 10 minutes of natural release for the potato to finish cooking, before removing the lid. This timing is for sweet potatoes only. White potatoes cook faster and won’t go by this timing formula. To speed the cooking time, cut the sweet potatoes in half and go by the appropriate timing for the weight of the largest half. You can also cut the sweet potatoes into cubes for even faster cooking, as noted in the post above. 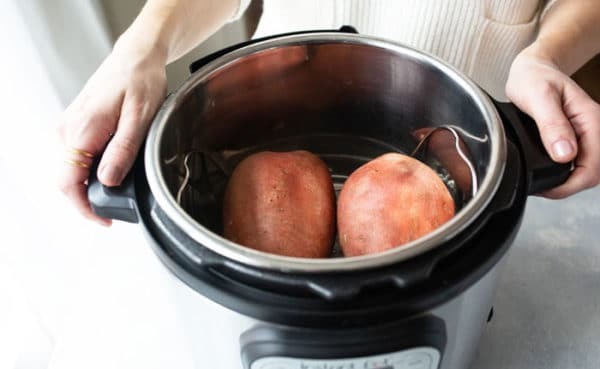 Reader Feedback: Have you tried cooking sweet potatoes in your Instant Pot yet? What’s your favorite thing to serve them with? The formula works! I used it for dinner last night with halved sweet potatoes and timed it for the largest one of the batch. No issues whatsoever and, thanks to your info on timing of pressurization and pressure release, the potatoes were ready with a few minutes to spare. Thanks for doing all the legwork on figuring this one out! I love the details you include in your recipe directions. I’m still new to the Instant Pot, and this is really helpful! I’ve been watching your YouTube videos, too, and you’re making me feel more comfortable with it all. Thanks! You are a genius. Tried this formula yesterday and it was the first time that ALL of my sweet potatoes were cooked all the way through! 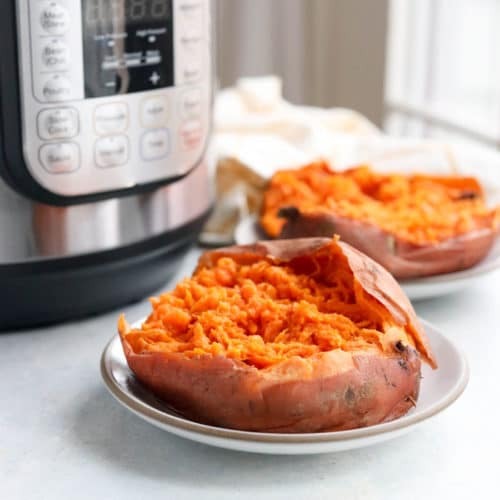 I love making sweet potatoes in the Instant Pot! This timing worked great for me today. Thank you for figuring this out! I haven’t had the best luck with cooking sweet potatoes up until now, but I just followed your formula and they came out perfectly. Will definitely be using this from now on!